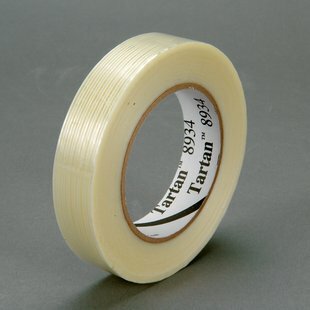 Scotch® Filament Tape 8934 is a a general purpose clear fiberglass-reinforced tape with a synthetic rubber resin adhesive. It is ideal for light duty strapping, bundling and reinforcing. Adheres well to most fiberboard, plastic and metal surfaces. Synthetic rubber adhesive bonds well to fiber board, plastic, and metal surfaces. Trasnparency provides visibility of box graphics, barcodes, and images. Glass yarn filaments add strength for box closing, bundling and more.